As almost half the country watches their thermometers drop well below freezing this week, we can all take a look at how the Navy gets some warm rays without having any land in sight. 'Steel Beach,' as these events are called, evolved from your great grandfather's swim-calls. Since then they have come a long way and now can include BBQs, Volleyball, kiddie pools, carnival games, 5k runs and even beer. Taking place on everything from the flight decks of the Navy's massive nuclear aircraft carriers, to the surfaced backs of nuclear submarines, Steel Beach gives overworked crews a day to unwind, catch some sunlight and remember that there is a life outside of their posts. For decades, Steel Beach events were more or less a big male only beach party. Now, with the integration of the sexes across the Navy's fleet, they are a coed and a more politically correct affair. Seeing pictures of a super carrier during a Steel Beach day can be quite daunting, especially if the entire air wing is deployed. The carrier's 4.5 acre flight deck, which looks expansive even when 25 ton fighters are operating from it, looks much smaller when thousands of people mingle pour out onto it. It is just another reminder of just how big of a floating town the super carrier really is, with about 5,500 people embarked during cruise (that is equivalent to exactly five of my high schools!). 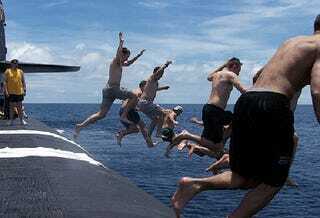 The 'Gator Navy's' collection of LSD, LHDs and LPDs, which have both a large flight deck and a giant semi-submersible well deck, have the advantage of being able to turn their sterns into massive indoor swimming pools or literally beaches made of steel (see also the top picture in this post). It is definitely a change of scenery when you see gobs of people in civilian clothes mingling among some of the most advanced weaponry in the world. Nothing like eating some BBQ while sitting on top of a Tomahawk Cruise missile, an SM-2/3 surface-to-air missile, or below a Super Hornet armed with AMRAAMs and Sidewinders. The Vertical Launch System "cell block" makes a great place to chill out during a Steel Beach picnic on this Ticonderoga Class cruiser. Steel Beach cookouts usually go hand in hand with other smaller events and activities. Music is a staple, live or via DJ, and everything including 5k marathons, carnival-like activities, sunbathing, swim calls, basketball and volleyball games and even fishing can be a part of the day's events. Sometimes, unique activities such as boxing matches, concerts, or a fireworks displays are paired with Steel Beach events. In the past, on seemingly rare occasions, 'Beer Day' can coincide with Steel Beach. For 100 years US Navy ships have been technically dry (unlike many other Navies), but after 45 days of continuous sailing, with at least five days till a port of call, a Beer Day can occur at the COs discretion and on approval from higher-ups. Beer Days seem to be a very rare occurrence these days, but I am told they do happen. During which, each crewman of age that does not have near-term staffing commitments, will be allowed to have two beers. Usually they are of the crappy variety (see Natty Light), but they are very much well invited nonetheless. April 20th, 2003: Sailors of the USS Harry Truman prepare for Beer Day which coincided with Steel Beach. The super carrier was taking a break from extremely high tempo operations during the opening phase of Operation Iraqi Freedom. 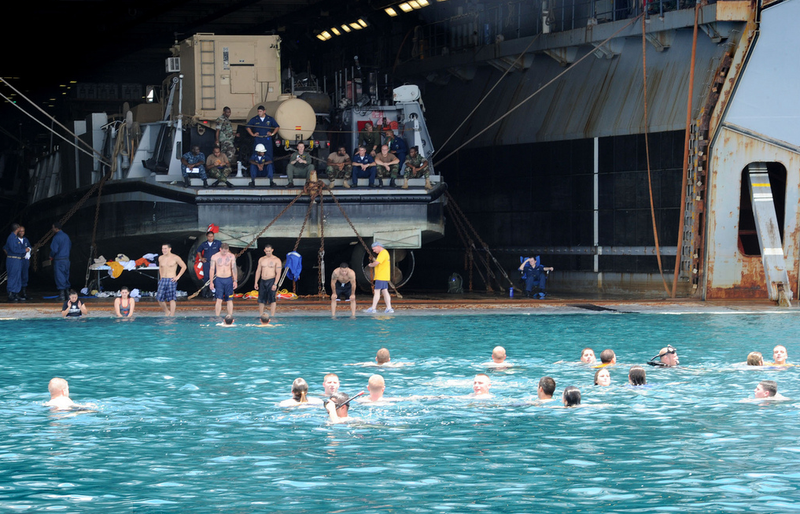 In the end, Steel Beach is a day off for many of a ship's crew more than anything else, and it is an especially useful 'tactic' when Carrier Groups have been running cyclic operations during combat situations and coming in for a port visit is not in the cards. Considering that many jobs on US Navy surface combatants, and all jobs on submarines for that matter, can mean not seeing much daylight for weeks at a time, getting out and seeing the horizon while breathing some fresh air is a sweet reward in itself. Steel Beach is just form of resourceful icing on that metaphorical cake.